This is one of many illustrated articles on the Author’s Astronomy Digest including two further articles about refractors. I love refractors – and have far too many! One reason is that they are the only telescope type that, if well designed and manufactured, can give essentially perfect images. Their only downside is that they are expensive for their aperture and other telescope types (to be covered in future essays) are far better suited to view or image faint star clusters or galaxies. I believe that every amateur astronomer should have a short focal length refractor to allow beautiful wide field vistas of the heavens to be viewed or imaged. Longer focal length refractors can provide stunning views of the planets and star clusters – and perhaps the best possible views of the Moon. There is too much to cover in one posting so this first one will look at their objective lenses. The first telescopes or ‘spyglasses’ as used by Galileo used a very thin single convex lens element as their objective. The fundamental problem with a single element is that the various colours of the spectrum come to a focus at different distances from the lens. The eye is most sensitive to green light so will focus on the green part of the spectrum. Thus the red and blue ends of the spectrum will be somewhat out of focus and this gives rise to what is called ‘purple fringing’ or ‘false colour’ that would be seen, for example, at the limb of the Moon or surrounding planets or bright stars. Providing the focal length was very long relative to the diameter of the objective lens − called the focal ratio (= f/a where ‘f’ is its focal length and ‘a’ the diameter of the objective) – then a passable telescope can be made. Indeed my first telescope, made at the age of 12 with lenses given me by my optician and mounted in cardboard tubes, allowed me to observe the craters on the Moon, the moons of Jupiter and a hint of Saturn’s rings – as of course had been observed by Galileo centuries before. This false colour is called chromatic aberration. It is believed that an English barrister and amateur optician named Chester Moore Hall discovered that by making an objective lens out of a combination of a concave element of flint glass together with a ‘slightly stronger’ convex element made of crown glass the chromatic aberration was largely cancelled out in the resulting long focal length objective. To keep his work a secret, Hall had contracted the manufacture of the crown and flint lenses to two different opticians but they, in turn, subcontracted the work to a single optician, George Bass. Later Bass mentioned Hall’s lenses to John Dolland who realised their significance and applied for a patent which was granted in 1758. The objectives are called achromatic doublets or, more simply, achromats and are still used in many telescopes. Provided the focal ratio is large, say from f10 to f16, these can make very worthwhile telescopes. 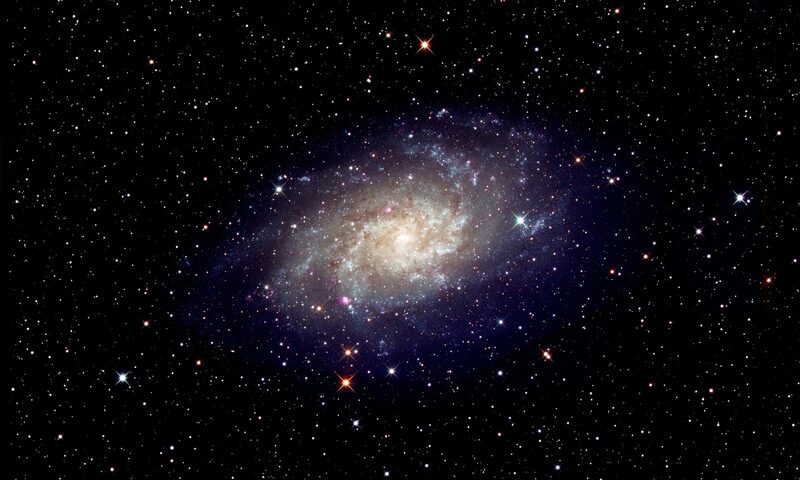 As their focal lengths will be relatively long, their field of views will tend to be small – which is why amateur astronomers are now tending to use doublet objects using more exotic glasses or lenses made up of three elements. These can suppress false colour even when low focal ratios in the range f/5 to f/7 are used and so provide the wider fields of view prized by both observers and imagers. Achromats got somewhat of a bad name when a number of manufacturers brought out 80mm aperture f/5 focal ratio telescopes. They are still available quite cheaply and can provide very wide field views at low magnification when false colour is not really a problem. An achromatic doublet can bring two colours of the spectrum to the same focus. In the past, one colour was in the red and the other in the blue (called blue-green-red correction) so when focussed in the green part of the spectrum where the eye is most sensitive, both ends of the spectrum would be somewhat out of focus and purple fringing would be apparent. Recent designs have tended to bring in these two colours towards the green/red end of the spectrum (called green-yellow-red correction) and ‘sacrifice’ the blue end of the spectrum. This halves the error in the red part of the spectrum but makes the blue and violet end of the spectrum very much out of focus so a broad blue ‘haze’ will surround the focussed image. However, with little energy in this part of the spectrum, this may not, in fact, be very obvious so an almost apo-like visual image can result. I have been advising amateurs not to buy such telescopes for general use, but do have one for use as a guide scope where false colour would not be a problem. It is said that as one gets older one’s sensitivity to the extremes of the visual spectrum gets less so more elderly observers may not find the resulting false colour a problem. One reason being that the yellowing of the eye’s lens tends to filter out the blue part of the spectrum. I suspect that this is true and was somewhat amazed recently when I turned my 80mm, f/5, achromat onto the Moon and could not really see any false colour near the limb. As confirmed in the comparison image below, I strongly suspect that this achromat is of the type, described above, which sacrifices the blue end of the spectrum. Filters can be used to remove the extremes of the visible spectrum so removing the effects of the chromatic aberration. One of the best is the Baader planetarium Semi Apo filter which attenuates the blue end of the spectrum. It gives a surprisingly neutral image and also incorporates a Neodymium substrate which actually boosts the colour contrast making it a superb planetary filter particularly for Mars and Jupiter. They can be bought from Rother Valley Optics and First Light Optics in the UK. John Dolland’s son, Peter, made a lens (using, I believe,three elements) which was an improvement on the achromat and in general these are called apochromats. Ernst Abbe, who became the research director for the Zeiss Optical works, independently invented the apochromatic objective and made a very precise definition of their properties – which, I suspect, very few modern lenses fully fulfil. They can bring three colours to a common focus. Their aim is to greatly reduce the chromatic aberration exhibited by an objective and enable relatively short focal length refractors to give virtually colour free images. Semi-apochromats are made using a doublet construction with one element made of an exotic glass having very low dispersion. True apochromats are usually constructed of three elements with one element of very low dispersion glass. But there is a ‘blurring’ between the two. Vixen and Takahashi have produced doublets using Calcium Fluorite (which exhibits very low dispersion) as one element and these can provide rather better correction than any glass type. However, there is now a glass type called FPL-53 which in that respect is virtually as good. Fluorite does has one appreciable advantage over glass in that it scatters no light so refractors employing a doublet objective lenses using fluorite for one element can provide the highest overall contrast (to be discussed in a further essay) of any telescope. My Takahashi FS102 with an f/8 fluorite doublet is one of my most prized possessions. Due partly to environmental reasons, fluorite is no longer commonly used, but Takashi still manufacture the FS-60CB (a small jewel of a refractor) and Sky 90 telescopes using fluorite doublets. In a refractor’s specification the glass type used as one element is often quoted. The table below gives some details about those most commonly used. Fluorite crystal, CaF2 with an Abbe Number of 94.99 − very expensive and hard to work with and now generally only found in relatively small diameter lenses. FPL-53 ‘Super ED’ or ‘FD’ glass made by Ohara in Japan with an Abbe Number of 94.94 − less expensive and easier to work with than fluorite crystal with a very similar Abbe Number to fluorite. Chemically more stable than fluorite. Also referred to as ‘Synthetic Fluorite’ or ‘SF’ glass. It is easier to design a colour free lens using FPL-53 than glass with lower Abbe numbers, but it is somewhat harder to figure and does not maintain its shape as well with changes in temperature. Triplet lenses using fluorite or FPL-53 can give essentially perfect correction for chromatic aberration both in focus and outside of focus. FPL-51 ED glass made by Ohara in Japan with an Abbe Number of 81.54 − less expensive and easier to work with than FPL-52 and chemically very stable. It maintains its shape better than FPL-53 with changes in temperature and this is an asset when apertures greater than about 115mm are considered. The colour correction will not be quite as good as smaller lenses made using FPL-53 and may show a little false colour in out of focus images but essentially none in in-focus images − which is what really matters. FCD1 ED glass made by Hoya in Japan with an Abbe Number of 81.6 − very similar to FPL-51. H-FK61 glass made by CDGM in China with an Abbe Number of 81.6 − very similar to FPL-51. It should be pointed out that the mating elements used to match the characteristics of the ED element are just as important in controlling chromatic aberration. In general, FPL-53 doublets will perform better than FPL-51 doublets of the same aperture and focal ratio and triplets will control colour better than doublets given the same aperture and focal ratio. I have highlighted the fact that this is true only when a comparison is made of identical apertures and focal ratios. When surveying the wide range of refractors of offer, one sees that FPL-53 tends not to be used to improve the chromatic aberration present in an objective over that when FLP-51 is used, but rather to reduce the focal ratio. So a FPL-51 doublet refractor might well have a focal ratio of f/6.8 whilst a telescope of the same aperture using a FPL-53 doublet would have a focal ratio of f/6 or f/6.25 with both exhibiting similar (low) levels of chromatic aberration. This is presumably as astroimagers prize low focal ratio telescopes! Triplet lenses using both FPL-51 and FPL-52 will tend to reduce chromatic aberration even further. The figure contrasts the images produced when employing a simple achromat (left) having an aperture of 80mm and an f/5 focal ratio and a semi-apochromat using a FPL-53 doublet, also with an 80mm aperture but with a focal ratio of f/6.5. The latter shows essentially no chromatic aberration. Interestingly, when the colour of the broad dark band highlighted to the left of the white window frame is analysed, that of the FPL-53 doublet gives 56 for all three values of R,G and B − so is a neutral grey, whilst that of the achromat gives R = 48, G = 47 whilst B = 83. So the false colour is weighted well towards the blue end of the spectrum suggesting that the achromat’s correction has been optimized to best correct for the green to red part of the spectrum as suggested above. It should be pointed out that these are 300% sized images. In the full screen achromat image the (mostly blue) fringing is not very obvious. It is worth discussing the relative merits of the two possible lens variants. In an air spaced triplet, the optical designer can adjust the surface radii of 6 lens surfaces, two for each lens, as well as altering the spacing between the three lenses whereas in a oil spaced triplet, the surface radii of the inner element must be those of inner surfaces of the outer lenses so giving the designer two fewer adjustable radii to include in the lens computation. As a result, it is slightly easier to correct for optical aberrations in an air spaced triplet. To overcome this problem in an oil spaced triplet, some manufacturers, such as CFF Telescopes, will make one lens surface aspherical. 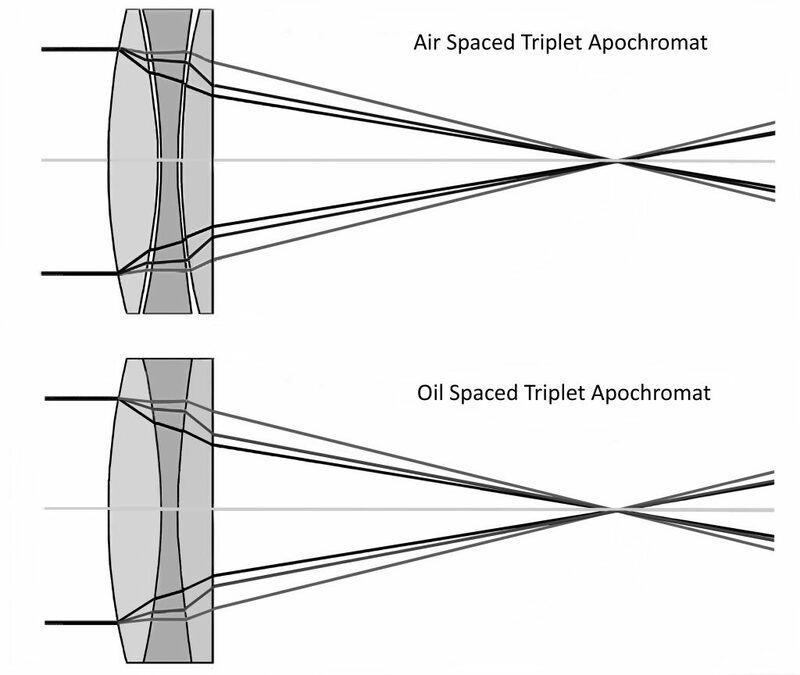 Theoretically, an oil spaced triplet should provide higher contrast that an air spaced one as there are only two surfaces on which to apply anti-reflection coatings. This used to be a real advantage but, with the excellent anti-reflection coatings now available, this has become less important. A further (and very real) advantage of an oil spaced triplet is that, as the inner element is in thermal contact with the outer two, the objective as a whole can cool down to ambient temperature far more rapidly than an air spaced triplet − which may never reach thermal equilibrium if a night is cooling rapidly. The era of apochromat telescopes for use by amateur astronomers really began in 1981. An amateur telescope maker called Roland Christen had come across a batch of an abnormal dispersion flint glass that had been ordered by NASA but not used. Christen was able buy this glass and designed some triplet lenses using it for one element. His prototype five inch, f/12, refractor produced the best images of Jupiter of any telescope at the Riverside Telescope Making Conference and earned him the prize for the most innovative optical design. Not long after he gave up his well paid job, set up a company named Astro-Physics, and went into the full time business of making telescopes. The refractors made by his company are some of the most prized telescopes now available − with a very long waiting time before one is able to acquire one new. I might point out that the company also manufactures some world class mounts. Their Mach 1 portable mount is another of my most prized possessions.